I love coming home to find my monthly subscription waiting for me at my door. It’s like a gift from me, to me. Awesome! Julep is a beauty brand mostly known for their vegan nail polish. 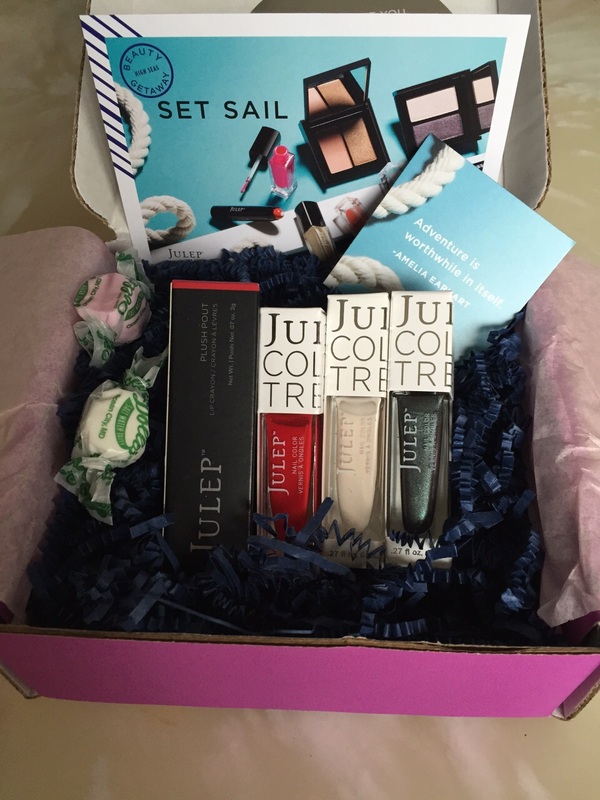 The brand is sold at Sephora, however, I purchase directly from the Julep online store and also receive their monthly maven box. For more info on the subscription or to sign up I’d click here. If you are really into nails than honestly this is the box for you. The theme this month is “set sail” and I received 4 nautical inspired products. I received January (classic red nail polish), Vanna (an off white creme colour nail polish), Becky (my mystery polish this month, it’s a metallic green/purple colour) and Julep’s Plush Pout (a moisturizing lip crayon in cardinal red). Lastly, I got some old fashioned candy. I’m absolutely in love with these colours! I like that if you don’t like the box you are sent, you can switch it for a completely different box OR you have the option to swap products from it. Ultimately there is no surprise when it comes to your box, you get what you want. They are very high quality nail polishes. There is a secret store at the beginning of the month for a couple of days, where they sell bundles and discounted items. It’s great that you always get full size products. If you just want to try it out my suggestion is to do the monthly boxes, and it’s 50% off the first month. This does sound amazing…i’m interested. So you pick out the colours? First you do a style quiz and they choose the box that best suits your style, however, say you like a colour from another box, you can switch out one of your items for that colour. So you get a choice from a selection of items they are offering that month.